How is that surprise Solo cameo even possible? And what might it mean for forthcoming Star Wars sequels, such as the rumoured Boba Fett film? Solo: A Star Wars Story answers all the questions you never had about everyone's favorite Corellian smuggler: Where did he meet Chewbacca? How did he win the Millennium Falcon? Why is his surname Solo? However, the latest Star Wars spin-off also throws in a shock cameo appearance that might have huge significance for a potential Solo sequel - or even for the rumored Boba Fett spin-off from James Mangold director of Logan. We explore some unanswered plot threads in our analysis of the Solo: A Star Wars Story ending, but here we'll discuss why (and how) this character cameo appears. Stop reading now if you haven't seen Solo: A Star Wars Story since things get really spoiler-heavy after the ewok below. Ee chee wa maa! Don't read on unless you've seen Solo: A Star Wars story, OK? Yub nub! before being sliced in half by Obi Wan Kenobi. Maul is played by original actor Ray Park in Solo: A Star Wars Story, but voiced by Samuel Witwer from the Star Wars animated series (who also played Galen Marek aka Starkiller in the Star Wars: The Force Unleashed game) and not original VO actor Peter Serafinowicz. He no longer goes by the 'Darth' prefix since there are only ever two Sith lords and that mantle has been taken up by Darth Vader at this point in the Star Wars timeline - with Count Dooku briefly taking the Sith apprentice role after The Phantom Menace until his demise early in Revenge of the Sith. How is Darth Maul still alive? Darth Maul's cybernetic legs sketched for the Star Wars The Clone Wars TV series. Maul appears in Solo: A Star Wars Story with a pair of robotic legs - in fact, that's the first we see of him before the camera pans up to reveal his face. After the events of The Phantom Menace, Maul (or rather his legless torso) is dumped on junk world Lotho Minor where he is kept alive by his anger and - ugh - a diet of vermin. These events are depicted in season 4, episode 21 of The Clone Wars cartoon. This series is officially part of the Star Wars story canon and takes place between the events of Episode 2 - Attack of the Clones and Episode 3 - Revenge of the Sith. Maul cobbles together some makeshift robotic spider legs before being rescued by his brother Savage Opress. After building new cybernetic limbs, Maul forms the Shadow Collective, an alliance of crime syndicates (including the Pyke Syndicate, Black Sun, and Hutt Clan). Maul and the Shadow Collective take over Mandalore, a historically warmongering race whose armor is worn (in adapted form) by Jango and Boba Fett. This attracts the attention of Darth Sidious, who kills Savage Opress and captures Maul… who later escapes and goes into hiding. It is sometime after this period of exile that Maul re-emerges as leader of the Crimson Dawn in Solo: A Star Wars Story… and it's what happens next in the Star Wars canon universe that has interesting ramifications for a Solo sequel… or even the rumored Boba Fett movie. The Star Wars Wookiepedia uses the terminology BBY (Before the Battle of Yavin i.e. the events of A New Hope) and ABY (After the Battle of Yavin) to place the movies in a timeline. We've listed when each movie takes place below, plus the known timings of canon TV series and comics, including The Clone Wars, Star Wars Rebels and comic Star Wars: Darth Maul - Son of Dathomir. How does Maul affect a Solo sequel - and raise the prospect of an Obi Wan cameo? Obi Wan Kenobi appears in the Star Wars Rebels cartoon and - once again - kills Darth Maul, this time for good (we presume). Let's rewind to what we know. At the end of Solo, our favorite smuggler (and Chewie) is in possession of the Millennium Falcon and discussing Tobias Beckett's tip off of a big job on Tatooine. The infamous gangster isn't named, but this is almost certainly a job for Jabba the Hutt. This may result in us seeing the deal-gone-wrong that leads to the bounty on Solo's head (where we find him in A New Hope) after he is forced to jettison Jabba's cargo upon being boarded by the Imperials. This is unlikely to be Solo's first job for Jabba, though. In Return of the Jedi, Jabba tells Han "You may have been a good smuggler, but now you're Bantha fodder!". This implies that they had a successful period of working together before the incident that leads to Han receiving a bounty on his head. Jabba also says "Han my boy, you're the best" during a deleted scene from Episode 4, further suggesting they shared a warmer rapport in times past. Avid watchers of the Star Wars Rebels cartoon TV show - which is officially Star Wars canon - will know this leads to an interesting intersection of events. In Rebels, the post-exile Maul finds himself on the ancient Sith world of Malachor (circa 3 BBY), where his attempts to build a super weapon are thwarted by two Jedi, Kanan Jarrus and Ezra Bridger. In his later attempts to tempt Bridger to the dark side, Maul learns that Obi Wan Kenobi is alive and in hiding on… Tatooine. It's on this planet (two years before the events of A New Hope, i.e. 2 BBY), that Maul and Kenobi clash again, and Obi Wan once again emerges the victor. This is chronicled in the Star Wars Rebels episode Mission to Tatooine and ends with Kenobi dealing a lethal blow to Maul's chest. Ezra is tempted to join the dark side by Maul in Star Wars Rebels. This is especially relevant, since Kenobi and Han Solo will be on Tatooine at the same time during any potential Solo movie sequel. However, the crossover appears a little too early for us to witness Maul's demise at Kenobi's hands in 2 BBY. Solo ends roughly in 10 BBY and it sounds as if Han is heading straight to Tatooine to meet Jabba. This would place a direct Solo sequel between 10 BBY - 8 BBY if there are no major time jumps. In 10 BBY, Obi Wan is in hiding on Tatooine (aged 47) and Luke Skywalker is 9-years-old. It's not impossible that either legendary figure might cameo in a Solo sequel. If a Solo sequel was to be much more generous with timings, however, and follow events up to 2 BBY it's possible that we'd witness Maul and Kenobi's final battle. Disney being Disney, however, there are potentially a lot of films (and potential paydays) to fit into that gap between 10 BBY and 2 BBY, which is where the rumored Boba Fett movie and Obi Wan movie come in. Could the Boba Fett movie act as an unofficial Solo sequel? We're assuming there will be a Solo sequel, of course. Alden Ehrenreich has signed a three-movie deal although this may be for appearances in other spin-off movies; and it's entirely possible Disney's desire for more Solo movies will be tested by the film's lacklustre opening weekend at the box office. This all needs placing in the context of rumors about the recent Boba Fett spin-off, linked to James Mangold, director of Logan. This rumor came as a surprise to many, not least since Obi Wan movie rumors were more prevalent with the prequel's star Ewan McGregor expressing interest in a return. Most recently, a fan claims to have met Ray Park (who plays Maul in Solo) at Comicpalooza, and said Park hinted that an Obi Wan movie was on the cards. Ewan McGregor is currently 47-years-old, i.e. the age of Obi Wan in 10 BBY, when a Solo sequel might begin. Here's the interesting bit: what if the Boba Fett movie is set during the years of 10 BBY to 2 BBY and explores the universe of bounty hunters and the court of Jabba the Hutt? It's not impossible that we may get to view a Solo sequel - or the events that lead to his betrayal of Jabba - through Boba Fett's eyes, and not Solo's. The Solo movie makes a throwaway reference to bounty hunters and Bossk who later appears alongside Boba Fett in The Empire Strikes Back after they are hired by Darth Vader to capture Luke. In the movies, Boba Fett is seen as a child in Attack of the Clones, and his young life is chronicled in The Clone Wars TV show. In an intriguing throwaway line, we learn that Solo's Tobias Beckett killed Aurra Sing, a character from the prequels glimpsed during The Phantom Menace pod race. The significance here is that bounty hunter Sing trains a young Boba Fett before meeting her fate at Beckett's hands, and the movie universe is hinting at another potential plot line for a Fett movie to explore. It's entirely possible that a Boba Fett movie could explore any period between 22 BBY and 3 ABY where Fett is swallowed by the Sarlacc monster in Return of the Jedi. Given Maul's resurrection after being chopped in half, you can't rule out a post-Jedi return for Boba Fett either (in fact, this has already been explored in a now non-canon Star Wars story A Barve Like That: The Tale of Boba Fett). In fact, the canon Star Wars: Aftermath novel also hints that Fett may have survived. So, where does this leave an Obi Wan movie? In terms of setting up a series of movies, you can imagine Boba Fett (estimated release 2021) establishing Jabba the Hutt's gangster syndicate around 10 BBY, allowing the movie universe to reveal more of Maul's character, with possible cameos from Solo, Obi Wan, or even young Luke. A true Solo sequel could then explore the events that lead to him receiving a bounty on his head circa 10 BBY to 8 BBY. An Obi Wan spin-off could then investigate the Jedi master's time in hiding circa 19 BBY to 2 BBY, culminating with the canon showdown with Maul; who will now be firmly established as a spin-off series 'big bad' villain. This is all speculation of course, and Disney's official timeline of new Star Wars movies doesn't feature Obi Wan, Boba Fett, or a Solo movie - although an untitled third Star Wars anthology movie is listed for 2020, one year after Star Wars 9. 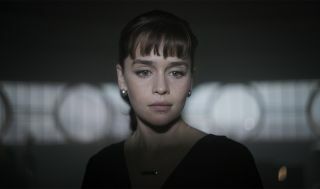 What is clear, is that the movies are carefully seeding clues about the interconnected universe much like the MCU (in fact, Solo's Qi'ra even makes a throwaway reference to using Teräs Käsi martial arts from the terrible Masters of Teräs Käsi videogame). Expect to know more when Episode 9 is closer to release, and Disney confirm their next Star Wars anthology movie. Do you think there will be a true Solo sequel? What events will it cover? Let us know in the comments below.